The situations listed above can narrow the carpal tunnel or cause swelling in the tunnel. 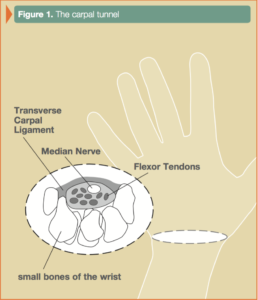 Thyroid conditions, rheumatoid arthritis and diabetes can also be associated with carpal tunnel syndrome. Ultimately, there can be many causes of this condition. 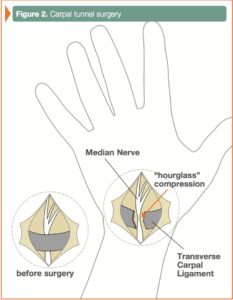 The numbness or tingling most often takes place in the thumb, index, middle and ring fingers. The symptoms usually are felt during the night but may also be noticed during daily activities such as driving or reading a newspaper. In severe cases, sensation and strength may be permanently lost. ely go away after surgery, especially in severe cases.